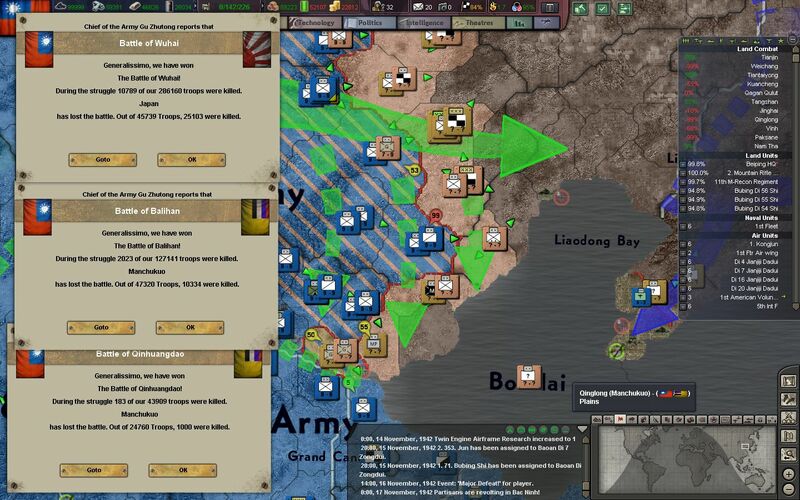 Previously, Generalissimo Chiang and Marshal Gu had launched Operation Mule and Operation Lotus, which involved the retreat of the National Revolutionary Army (NRA) to the Yellow River, and then the encirclement of Japanese troops in the Hebei Pocket. 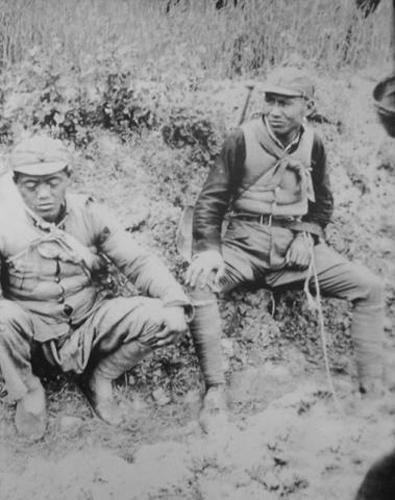 Nearly 75,000 troops of the Imperial Japanese Army (IJA) and the Kwantung Army have been captured or killed already, and a further 80,000 are fighting for their lives inside the rapidly-dwindling pocket. 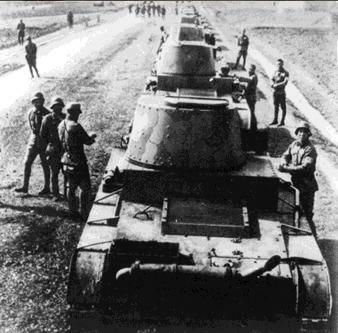 The remaining Japanese forces fall back to defensive positions in Taigu, which sits roughly 30km to the east of the city of Taiyuan. Exhausted by months of fighting and marching, many Japanese troops surrender soon after battles start, and our lines become saturated with cowards and deserters at night. Our spies from our intelligence services (the NBIS) report widespread dissent in the IJA camps. As our troops advance, they find the bodies of more and more deserters, shot by the Japanese military police - the ruthless Kempeitai. 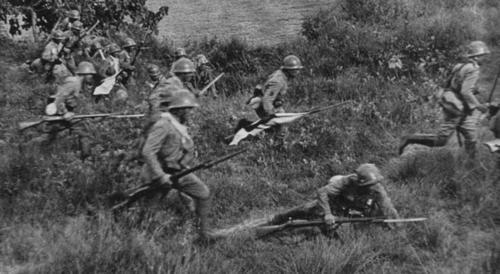 The Japanese relief force falters in the hills of Xinzhou, but not without an immense loss of men. 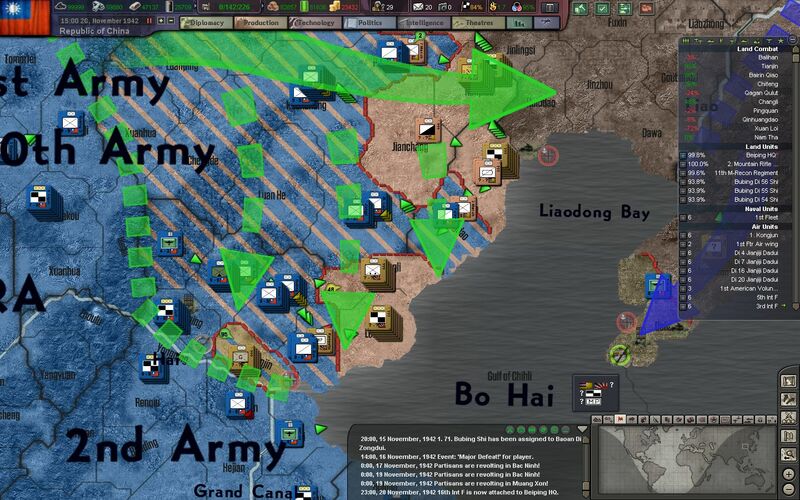 Our troops braved attacks from both Japanese armor attempting to break through, as well as counterattacks from the trapped troops in the Hebei pocket - all while maintaining a circumvellation just 15km wide. The Japanese high command officially abandon efforts to break into or out of the Hebei pocket, and the IJA troops trapped inside are officially forsaken. 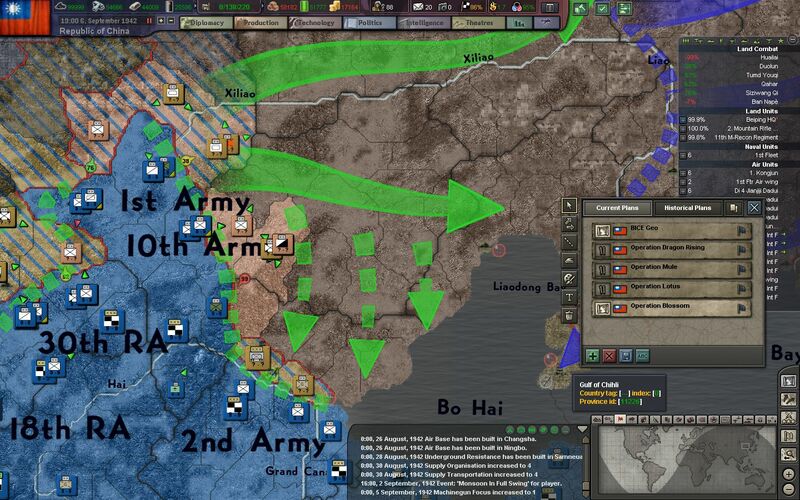 And as the final shots ring out in the Hebei pocket, Marshal Gu orders Army Group North to advance towards the Hai River line, which the NRA had held a few months prior. The situation, however, is vastly different than in the early Spring. 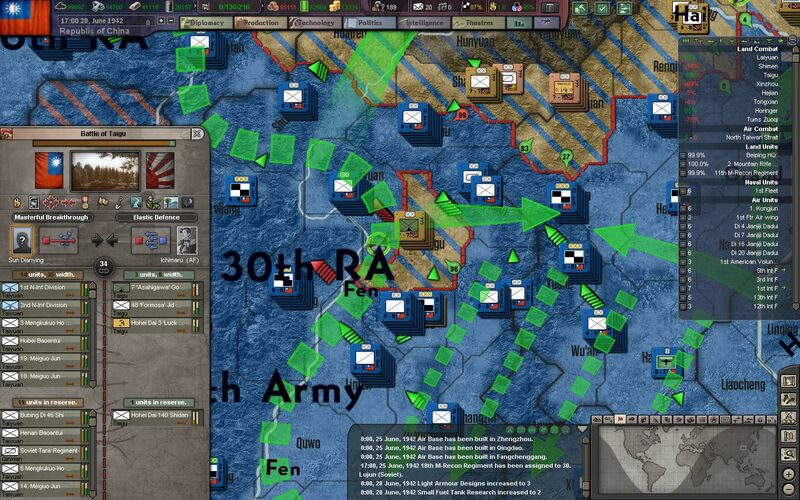 Japanese troops are undersupplied, underequipped, and many of its divisions are only at 50-60% strength. They no longer enjoy tactical or air superiority, thanks to the efforts of our arsenals and improved military infrastructure. Battles are won, and land is retaken, but many of our men march with sullen faces and empty gazes. Land that claims the lives of thousands is exchanged in a matter of weeks, and to them the war seems like an endless endeavor. They have lost friends and family in the battles for narrow strips of land - that were so easily abandoned during Operation Mule. Many serving in the NRA have been fighting since the invasion in 1938, or even earlier during the Warlord Era, the Expeditions, and the Central Plains War. Our new ballbearings plant, located in the suburbs north of Changde, begins production about a year after its construction began. Little by little we are weaning ourselves off the military aid of the US, and soon we will be able to arm and feed our armies ourselves. Generalissimo Chiang Kai-Shek approves more large-scale construction plans from the Interior Ministry, and this new 3 year project focuses on railway lines across China's coast and into its industrial cities. Supply routes to the front lines in Inner Mongolia and Indochina are prioritized, while resource lines, moving coal and iron from the West to the factories in the East, are planned as well. The industry of China moves forward, like a lumbering giant. The NRA begins phasing in maintenance companies for armored divisions, and those operating trucks and other heavy equipment. Maintenance depots are also constructed as our troops move north, in order to service the greater number of vehicles entering our service. Soon our machines, factories, and workers will be the envy of the world! After a quick advance, our troops are forced back into North Vietnam and along the Song Ca river. 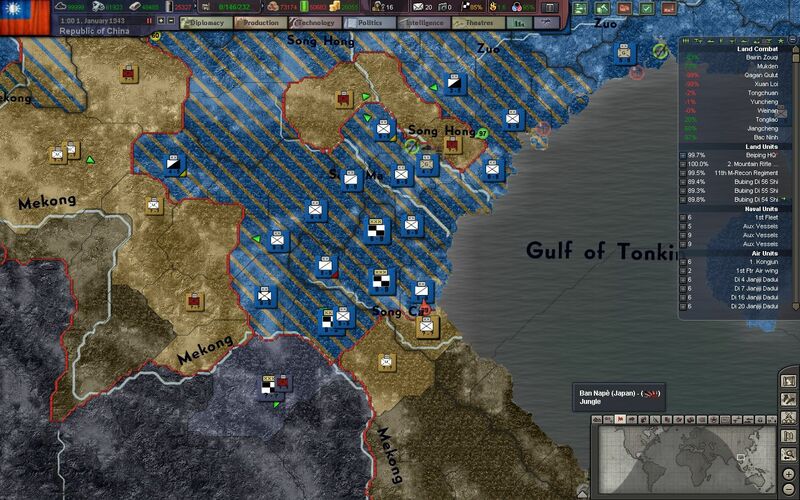 Troops that were previously occupied on the Malay Peninsula and at the Battle of Singapore have now moved north to oppose our advance, and we simply do not have the numbers or the infrastructure to mount new offensives. 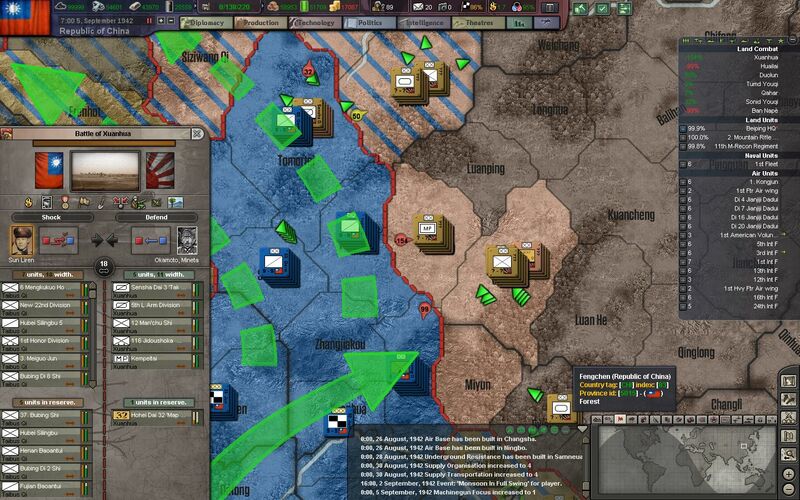 The advance on the Northern Front is slow and bloody, but it is moving steadily nonetheless. 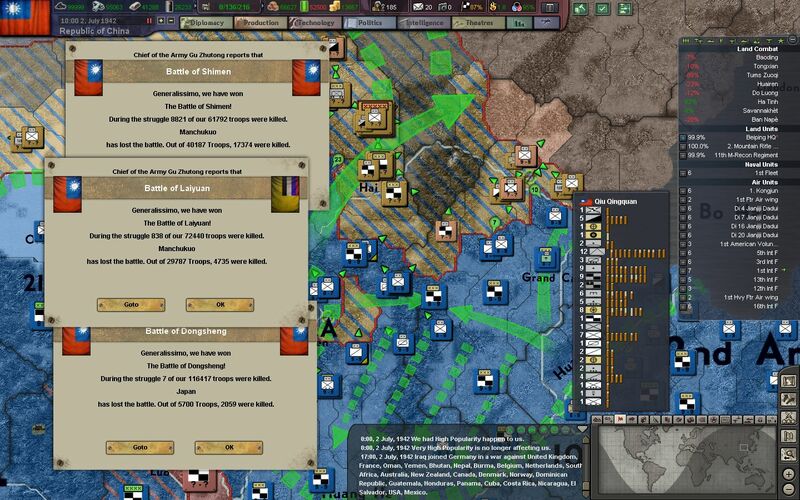 No matter what the cost, Marshal Gu orders our men to march north and prevent the Kwantung Army from regrouping and forming proper defensive postures. 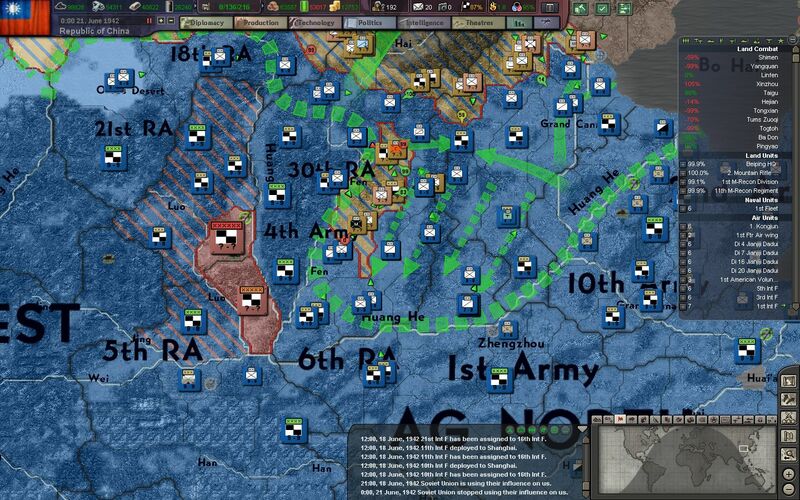 The Japanese losses begin to eat away at their effectiveness - as the supply and reinforcement lines from Japan begin to dwindle. 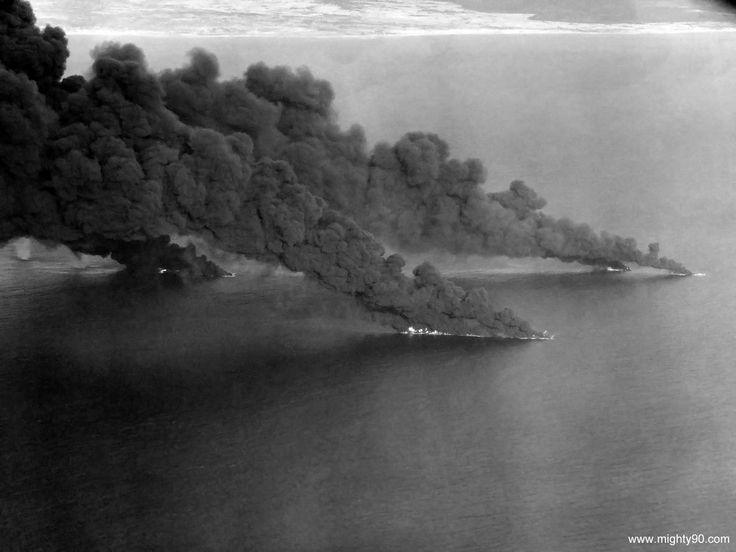 Japanese convoys, already stretched thin to supply troops all across the Pacific, are now under attack from American and British convoy raiders and submarines. 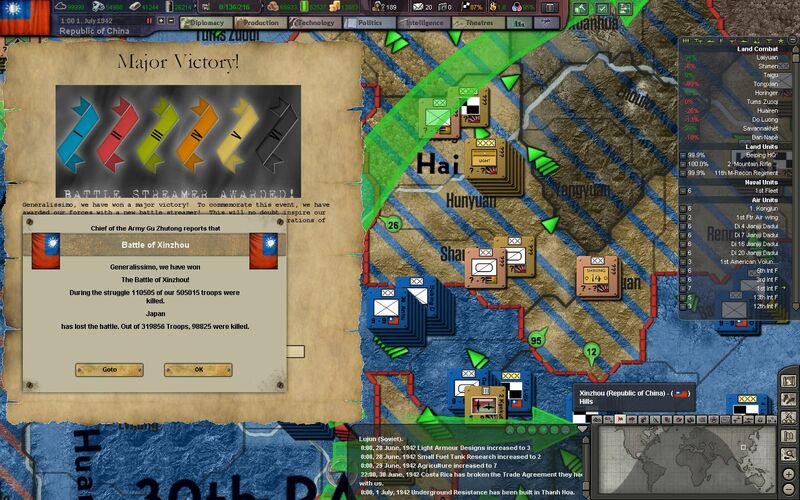 Additionally, the lack of foreign trade with anyone but their Axis allies has stretched the Japanese merchant marine to the brink. Our exhausted men continue North through the plains of Jining, and are just 150 km away from their starting points from Operation Mule. A desperate Kwantung Army begins to mount "Banzai" attacks in order to slow our advance. Losses from these battles are immense - and our casualty rates climb by the hour. Operation Lotus has already claimed the lives of 350,000 troops of the NRA, in just a short 5 months. 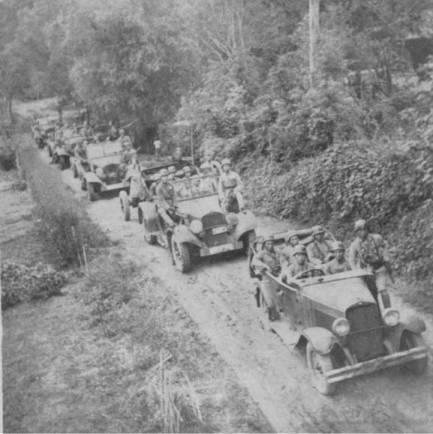 Our troops march back into the crater-filled, former "forest" of Fengchen - the battleground that was fought over for 2 years and claimed the lives of nearly 2 million from both sides. This time though, the trenches in Fengchen are abandoned, and our troops hold solemn ceremonies for those lost in the "Forest of Blood". 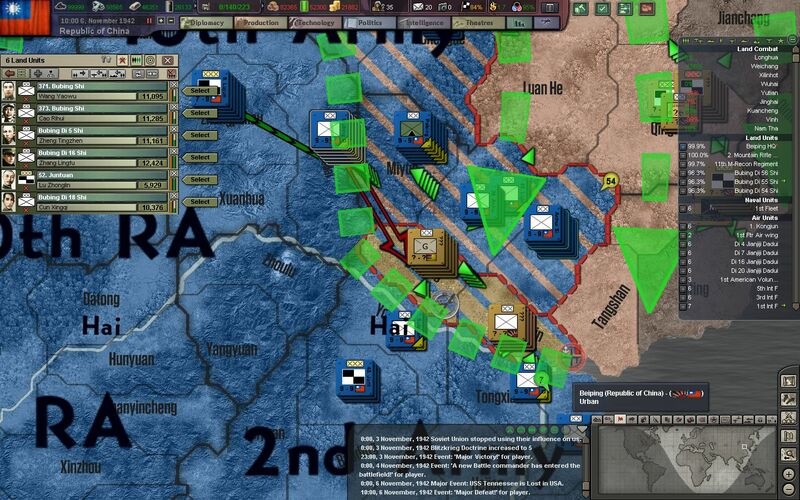 There is little time to spare, and a day later elements of the 1st Army and 30th Route Army continue their march north. 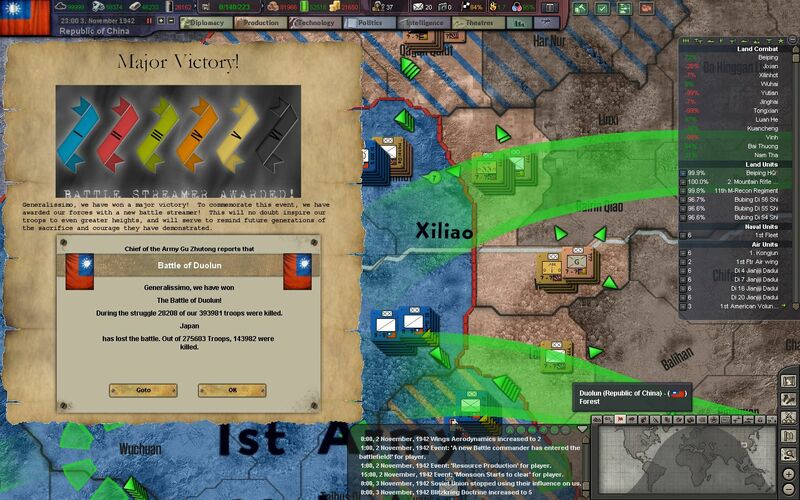 The NBIS and general staff report that almost 300,000 Japanese troops have gathered in the Ordos and Bayannur Regions of Inner Mongolia, presumably for an offensive south towards Shaanxi and Xi'an. 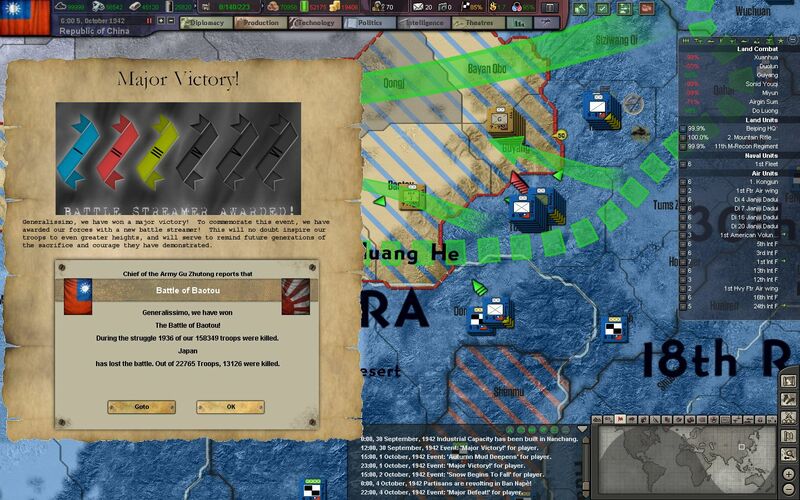 The recent advance made by our forces into Hebei, however, has seemed to have thrown a stick into their plan. 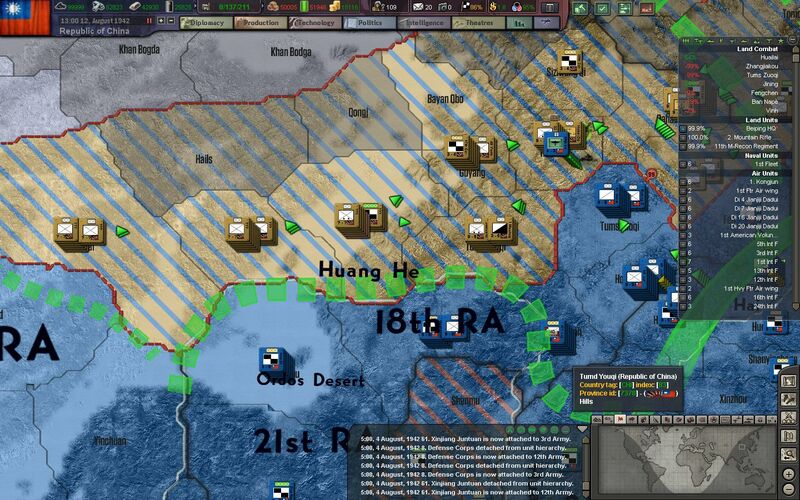 Chiang orders this pocket to be encircled and destroyed before they are given any chance to escape. The war in Indochina gets bloodier and bloodier, as both sides resort to more extreme tactics in order to survive. Our troops have resorted to burning the vegetation off hilltops and ridges, in order to escape the damp and trap-laden jungle. And the Japanese have began to attack almost exclusively at night with waves of men, which frequently overrun and annihilate our defensive positions. 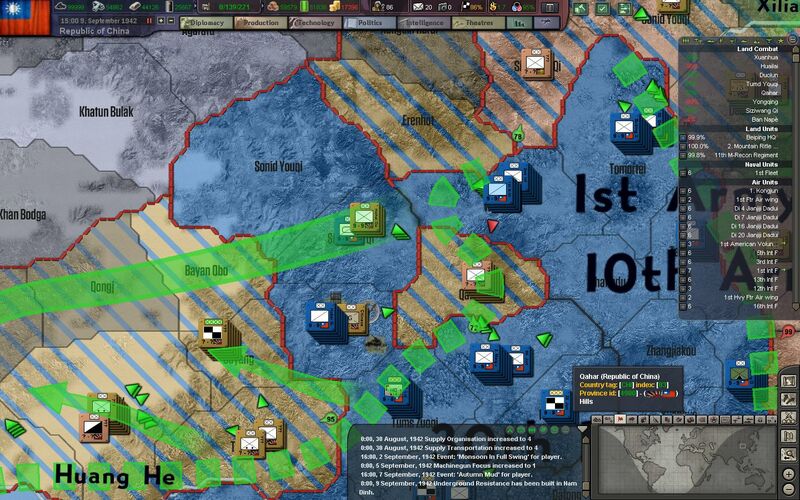 Our mobile forces of the 6th Route Army seize the highlands of Inner Mongolia, and formally seal the trap for nearly 300,000 Japanese troops now encircled in the Ordos Pocket. The main attempt to break out by Japanese armored and motorized forces falls short, but not before inflicting horrendous casualties on the NRA defenders. 80,000 lie dead on both sides after the 20-day long breakout attempt. 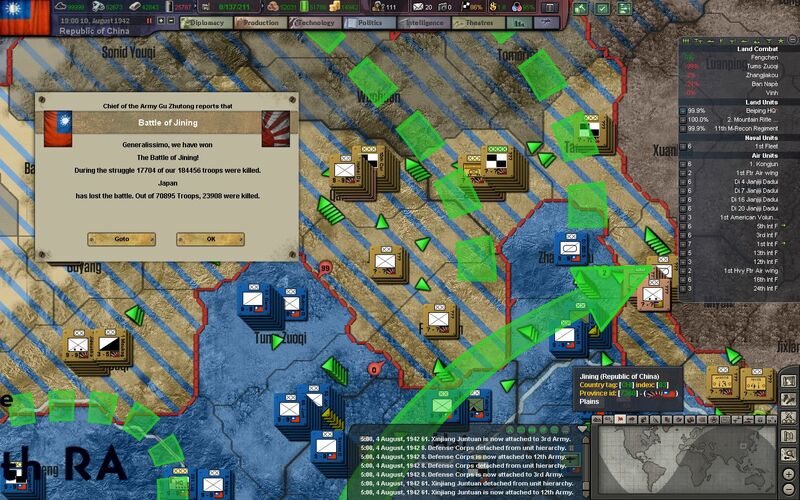 Our T-26, BT-7, and CV33 Tanks and Tankettes finally find some operational freedom in the Inner Mongolian steppes, and are the main scouting and exploitation elements employed by the NRA. 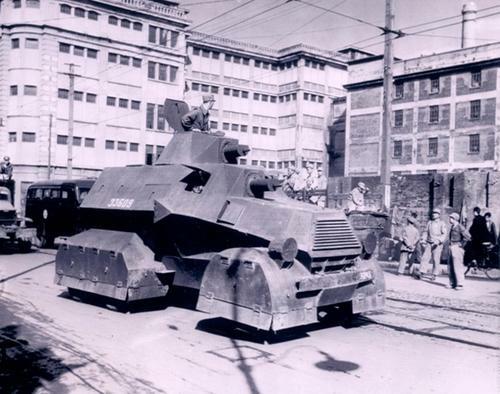 These dated fighting vehicles are very vulnerable to modern anti-tank guns and enemy armor, and our armored brigades still experience a high loss rate. 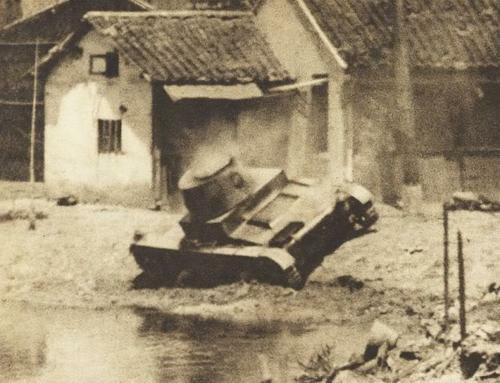 Pictured above is a Chinese T-26 knocked out by an anti-tank round to its tracks. Thankfully the tank crew of the T-26 above was able to escape - many others are not so lucky. The Monsoon season begins in full force as our troops dig into defensive positions on hilltops and roadways. Only the bravest of our light and recon troops volunteer to take on jungle patrols, and it is not uncommon for them not to return after nights of heavy fighting. 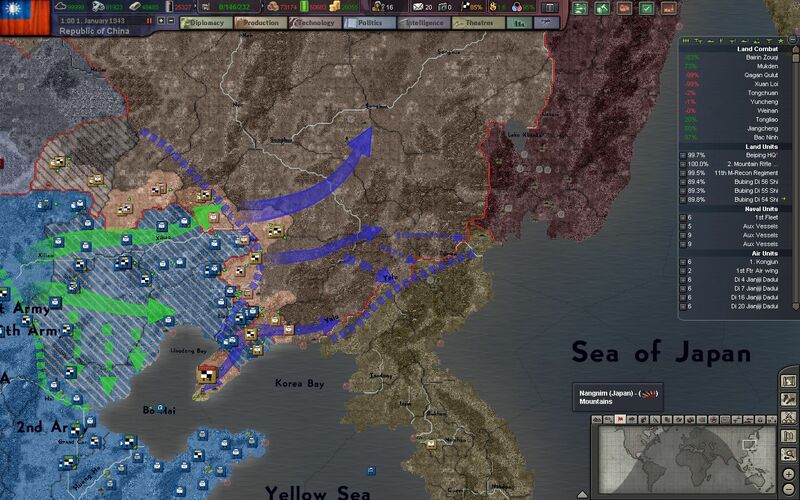 The majority of Japanese divisions now are sitting at less than 50% strength. Japanese divisions that used to command 3 regiments of infantry now only have an effective strength of 1. 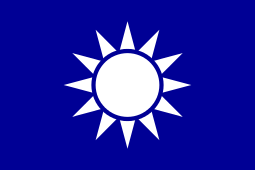 In addition, the veterans of the Kwantung Army that launched the invasion of China nearly 4 years ago are largely gone - either captured or lost to combat. These new, green recruits struggle to bat back the relentless attacks of the NRA. 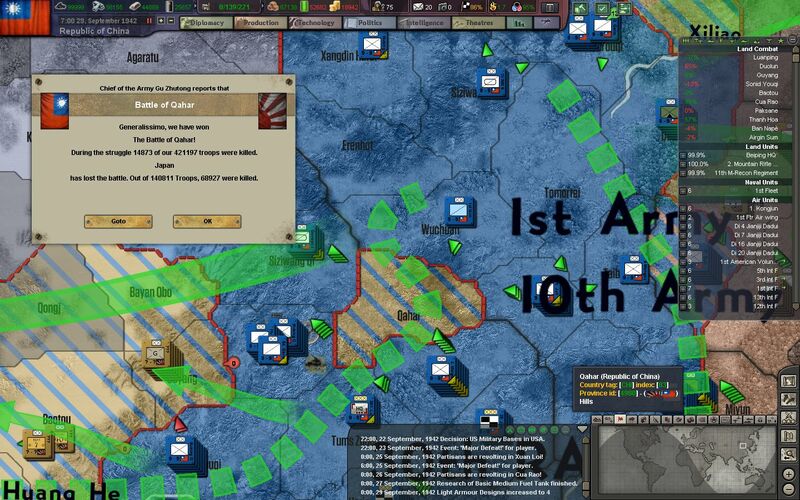 Marshal Gu and the general staff draft the expansion to Operation Lotus: Operation Blossom. 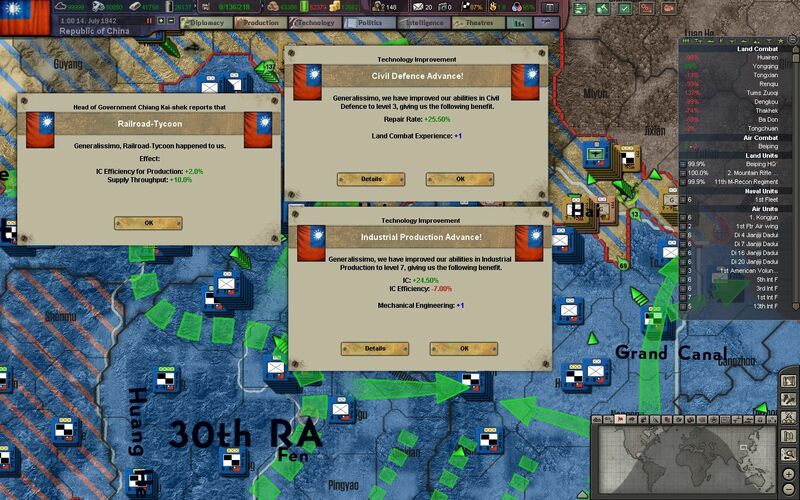 The 21st RA (Route Army) and 30th RA will be assigned to finish off the roughly 300,000 Japanese troops trapped in the Ordos Pocket, while the rest of Army Group North will focus on the encirclement and recapture of Beiping-Tianjin. 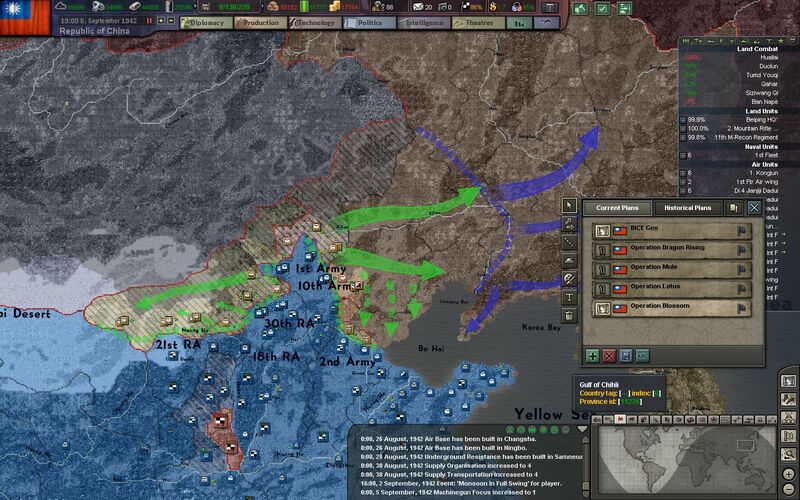 Secondary objectives are to capture the crucial port and airbase of Dalian, and then to advance into Manchuria Proper. 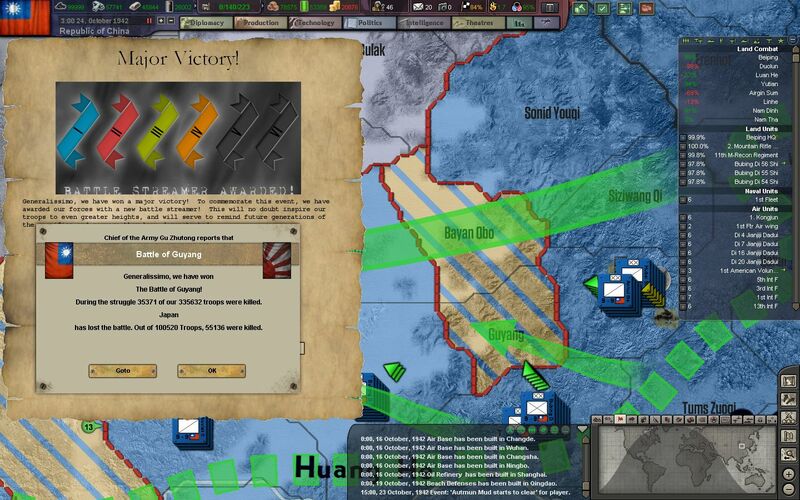 The 4th Army will continue the crucial task of blockading and containing the communists in Yan'an. 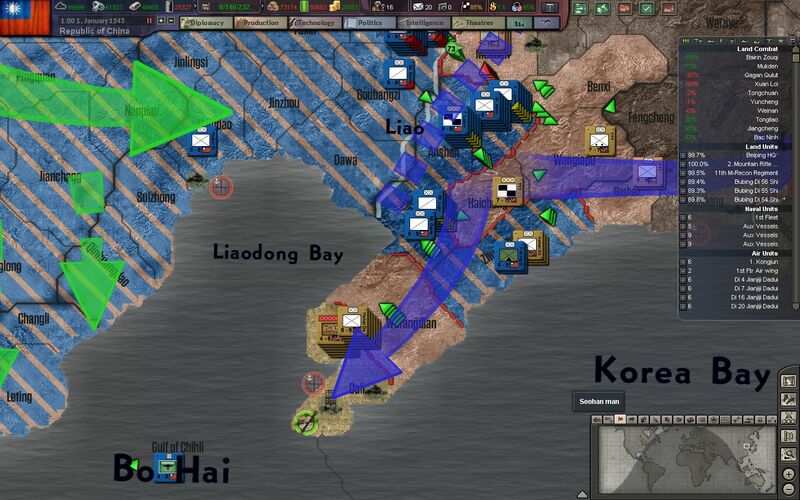 Our troops are to advance across a wide front towards the Bohai Sea and the port city of Huludao. Afterwards, they will swing southwards and assault the city from the North. 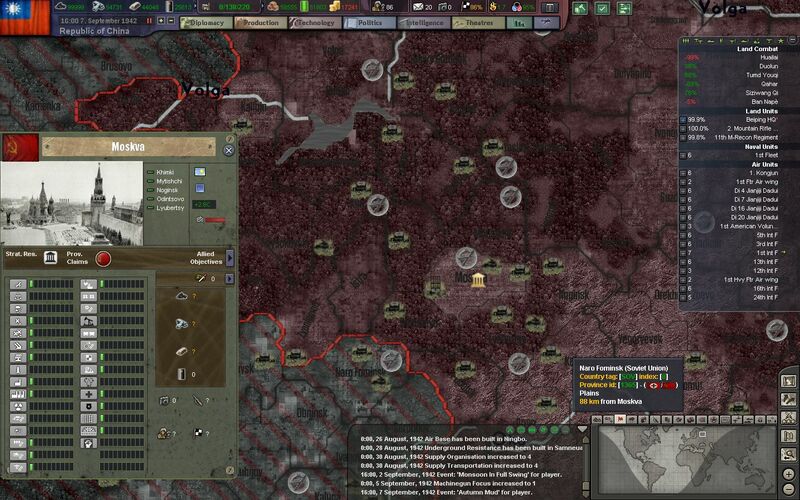 Hitler, meanwhile, orders another offensive on Moscow, and this time gets within 90 km of the city. Stalin orders the Red Army to guard the capital to the death, while he and the Politburo make secret plans to evacuate the city and the government should the need arise. 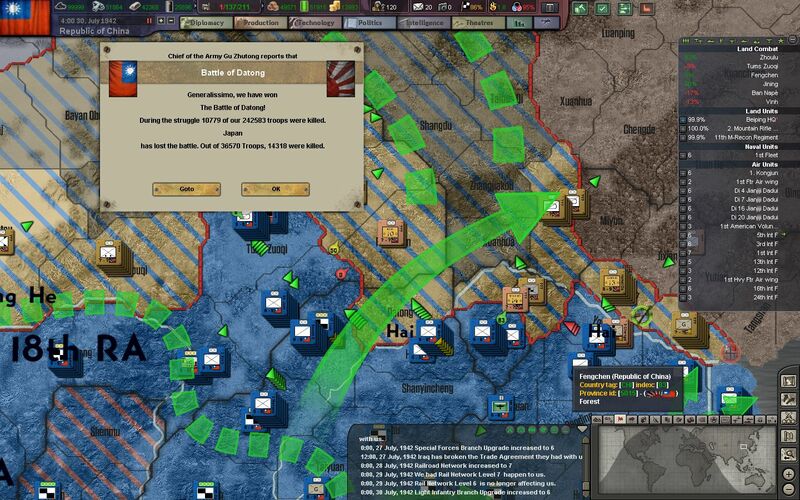 Fall Blau, however, meets significant opposition as German forces as pushed off the Taman Peninsula and back onto the Perch Peninsula in Crimea. 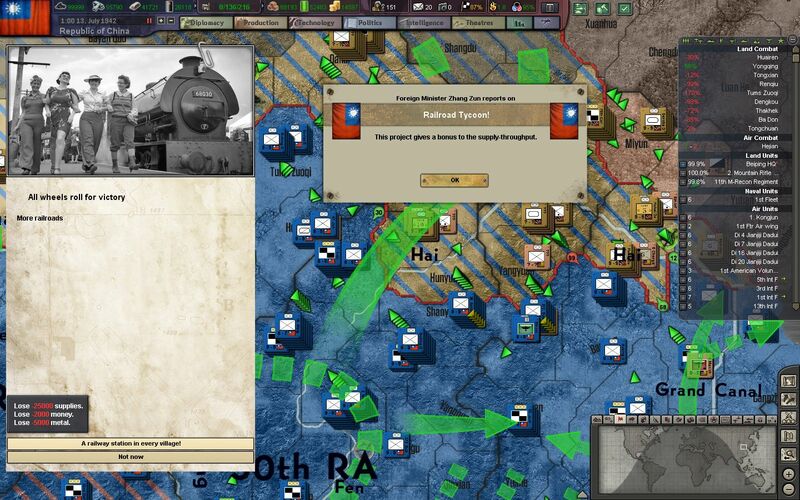 Fierce fighting erupts on the strategic city of Rostov Na Don, and the German spearhead into the Caucasus is now preoccupied in urban combat. As fall and winter approach, German troops prepare for another bloody and cold winter in Russia. 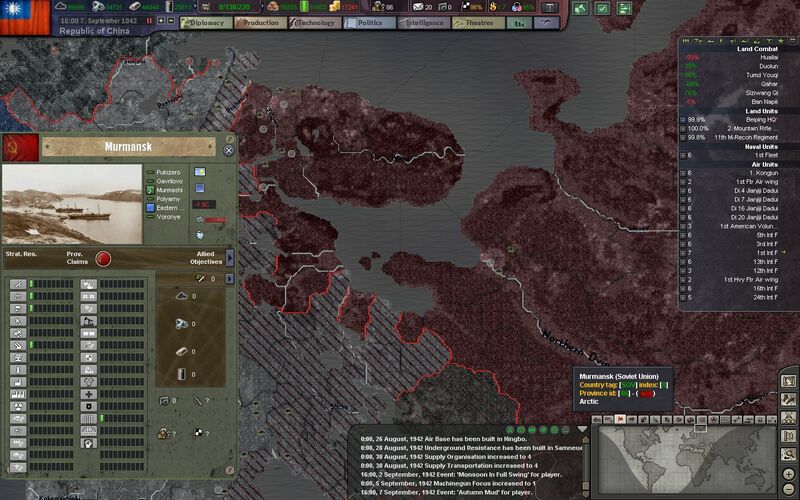 The port city of Murmansk has been surrounded and blockaded by the Finns, who have now launched another attack to threaten Arkhangelsk (Archangel). Murmansk and Archangel were the only warm-water Atlantic ports available to the Soviet Union, and the Red Army finds itself starved of the lend-lease supplies from the US that it desperately needs. 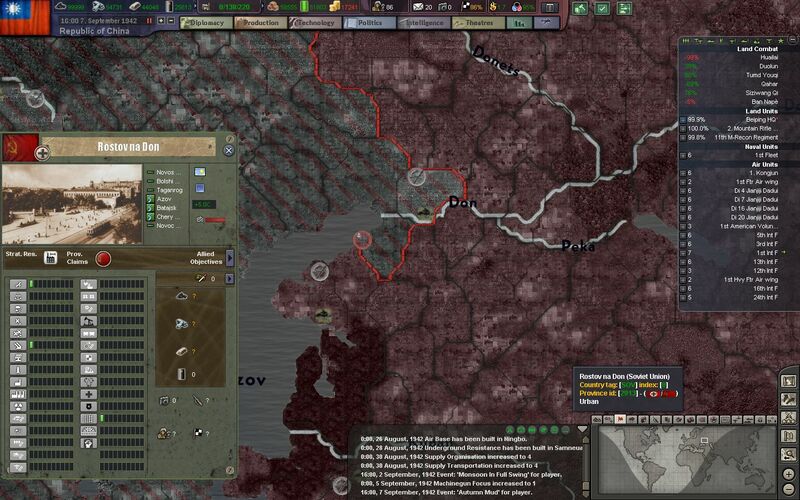 If these two ports are to fall in the hands of the Axis, the rest of the Soviet resistance may fall with it. 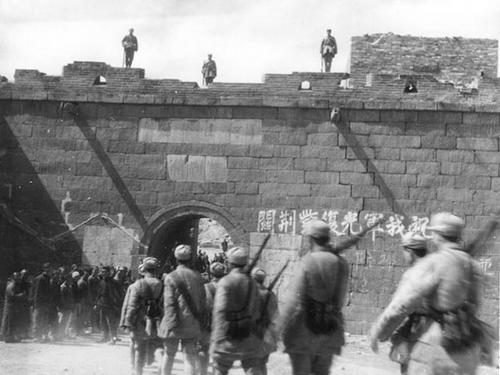 The city of Hohhot is recaptured by the 30th Route Army, and smaller pocket of nearly 100,000 Japanese troops is encircled in the plains of Qahar. 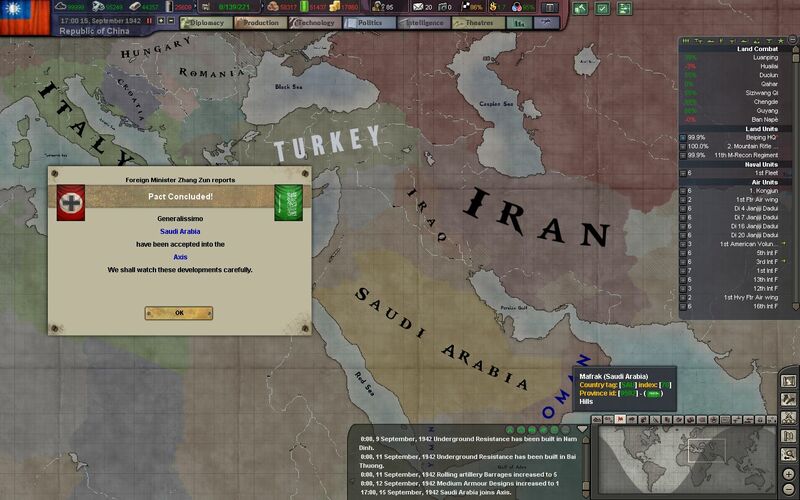 Following greater and greater British incursion into Saudi territory, the Prince of Saudi Arabia petitions for German military aid, in exchange for access to its vast oil fields. 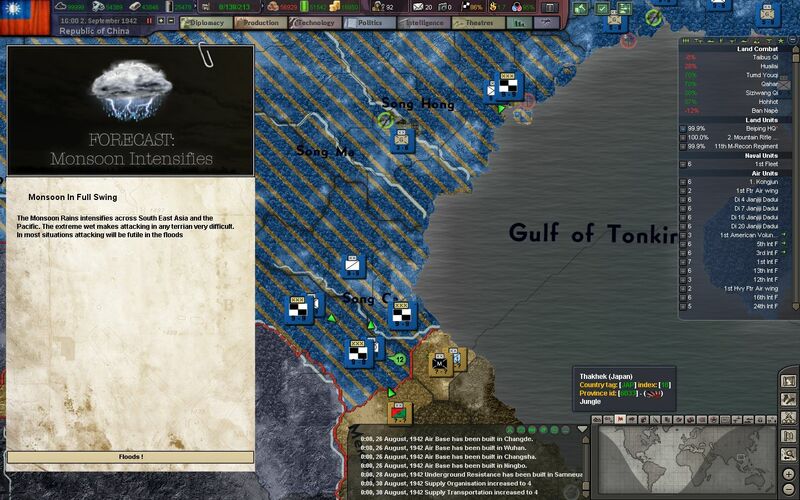 A massive insurgent uprising by Japanese agents and commandos has seized the area around the city of Hanoi in Indochina, and our reserve divisions are sent in to suppress enemy activity in the area. Although they are poorly armed and organized, they still pose a threat to our supply lines. Japanese forces in the Qahar Pocket are crushed, with 70,000 Kwantung Army men marched into the interior's now overflowing POW camps. They are the lucky ones - only half of the Japanese in the pocket escaped with their lives. Another 70,000 were killed in the defense, which after the exhaustion of bullets and munitions, were forced to charge our lines with little more than bayonets. 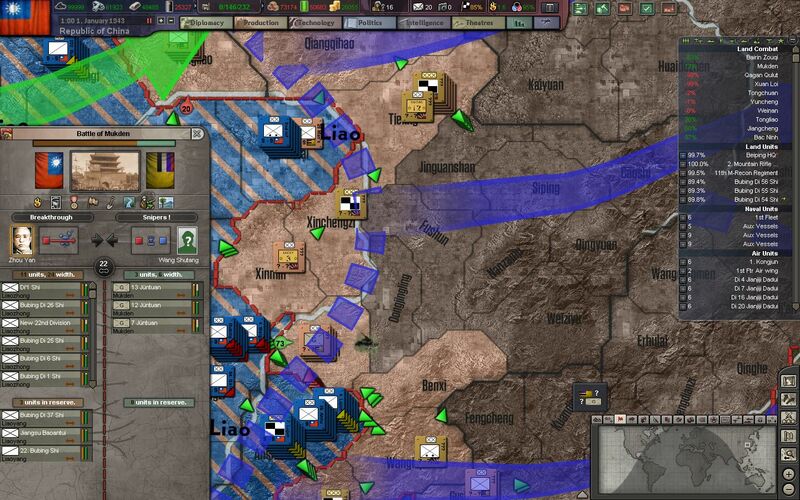 The Ordos Pocket shortens by the day, and another 80,000 troops are encircled in Guyang, west of the city of Hohhot. Our engineers finalize their first drafts for carrier air groups. 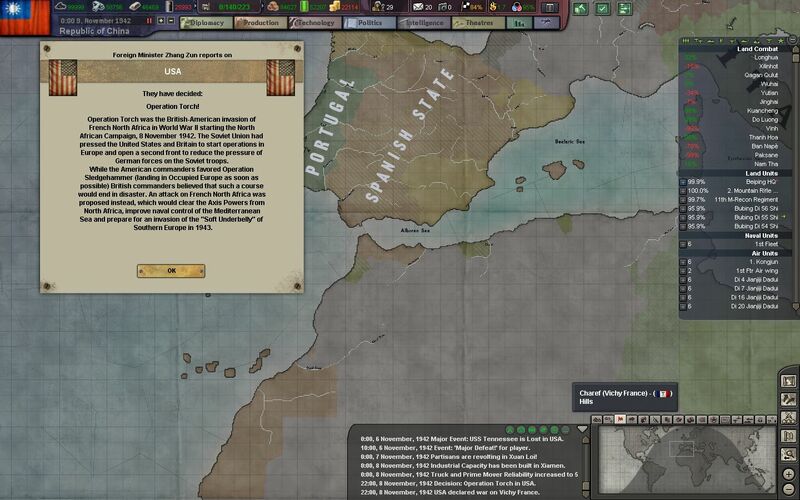 Our navy does not have any carriers at the moment, but these multi-purpose and mixed air wings will allow us to extend our air force into the sea, and begin to threaten Japanese shipping and naval operations. 300 light fighters, torpedo bombers, and dive bombers begin production at aircraft factories in Changsha and Nanning. Our forces partially surround Beiping, and our elite Mountain Divisions are the first to begin the assault on the city. 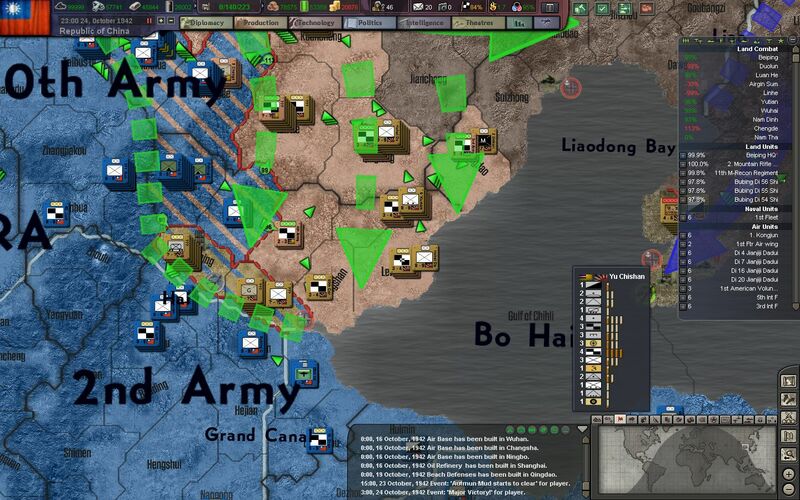 Beiping is defended by a few depleted infantry divisions, but it is mainly garrisoned with militia, collaborationist cavalry, and a few brigades of Kempeitai military police. Much of the Japanese regulars have already escaped north to regroup. 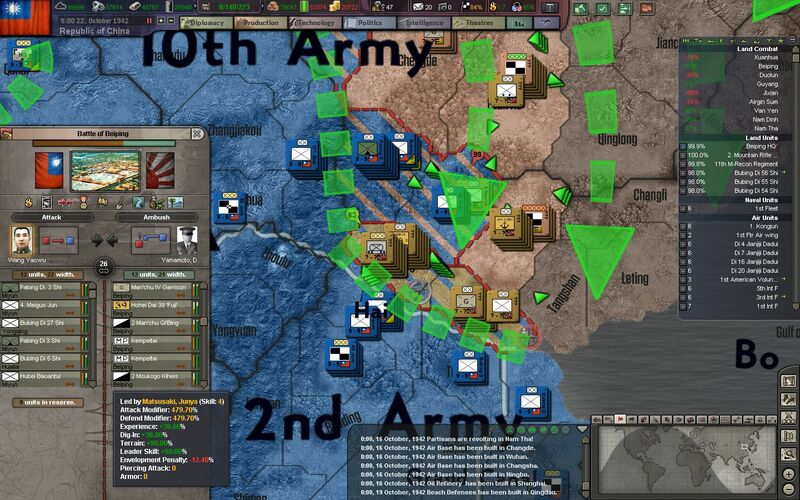 Another 100,000 Japanese troops are killed or captured in another pocket in Guyang. 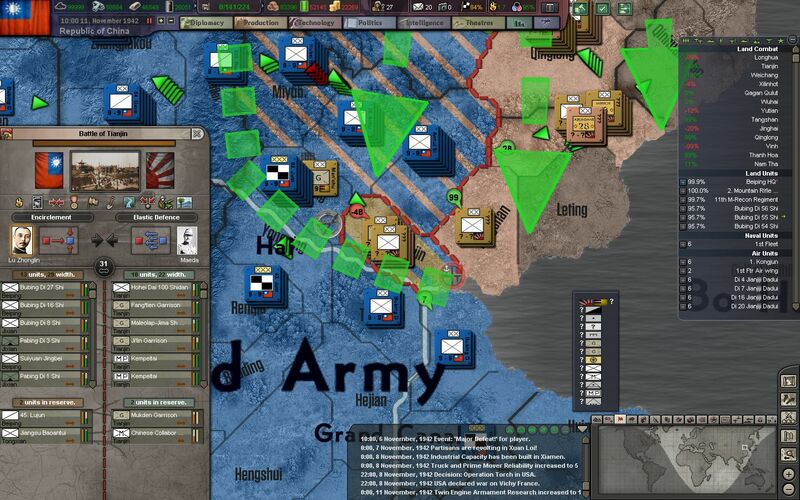 The general staff estimates that only another 80,000 troops remain in the Ordos Pocket, while the overall frontline strength of the Kwantung and Manchurian armies has been reduced to just 900,000 troops (200,000 combat-effective) overall. In just 6 months the NRA has destroyed nearly a third of the Japanese presence in China, while forcing the rest into a general retreat. Aerial reconnaissance backs up the intel from the NBIS. 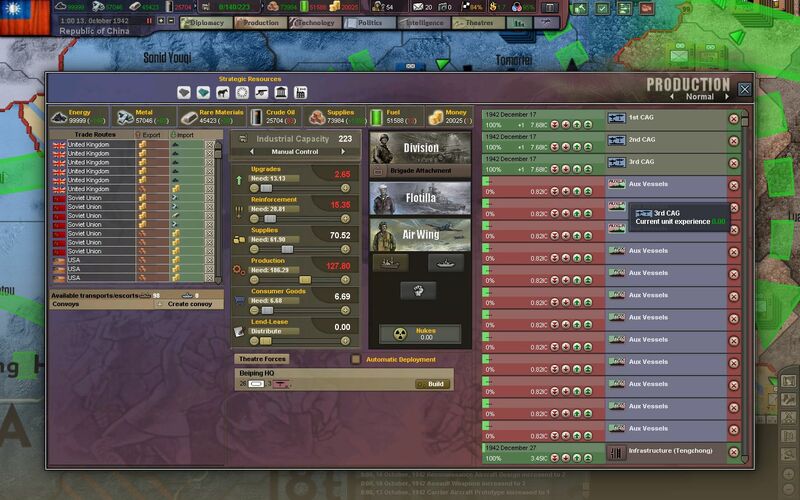 Japanese divisions are disorganized, undersupplied, and vastly understrength. Only a token amount of troops are left to defend Beiping and Tianjin, while the rest flee north to more defensible positions. 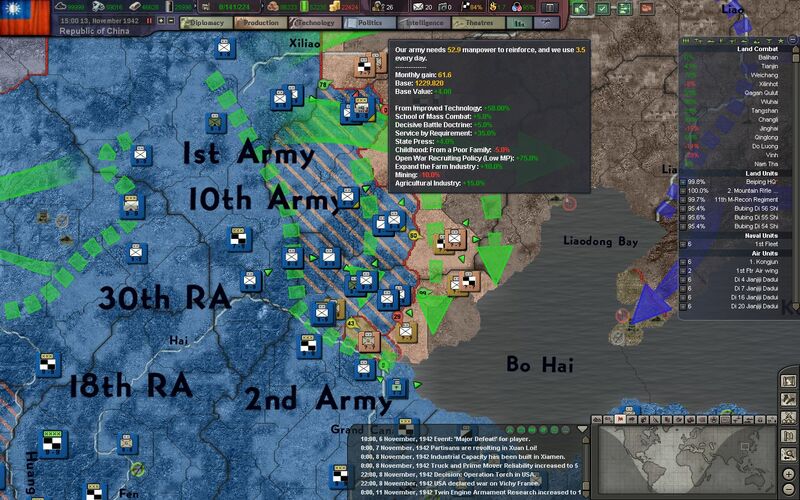 While much of the Kwantung Army near Beiping crumbles and retreats, the last healthy remnants attempt to swing a decisive battle in the North, but they are thrown back and join the rest of the Kwantung Army in retreat. The news is less optimistic in Indochina. 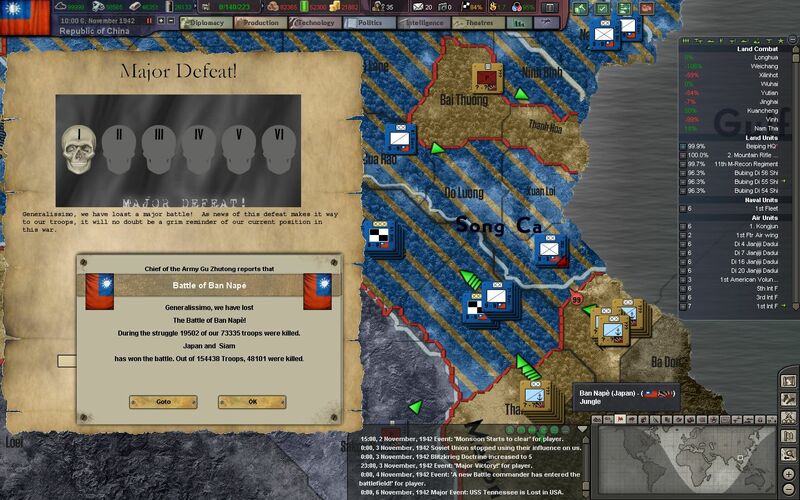 Our forces have been fighting a losing battle since the start of the Monsoon season, and the 12th Army is forced to fully pull back to the Song Ca River. Combat is just one worry of the troops of the 12th Army in Indochina. Disease, booby-traps, and land mines account for most of the casualties in Northern Vietnam. Fever, dystentery, and typhus is a growing problem among our troops, who struggle to receive vital supplies through the thick jungle of the region. 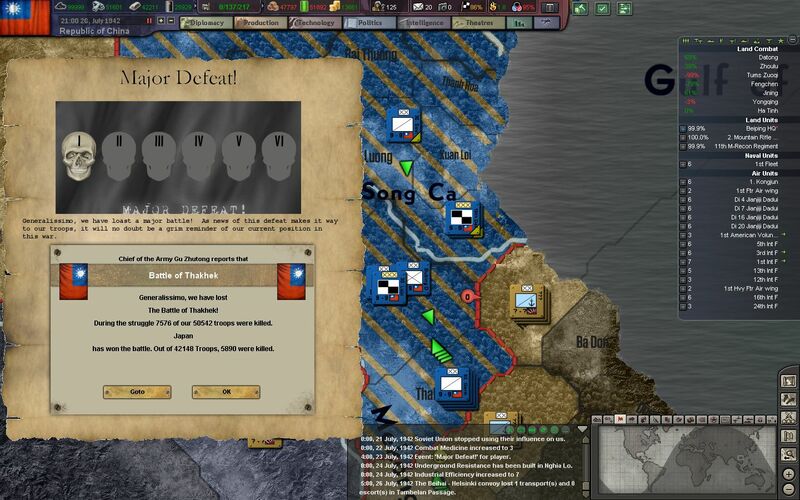 On the 6th of November, 1942, almost exactly 4 years after it was lost to the initial Japanese invasion, Beiping falls back into the hands of China and the Kuomintang. Fighting in the streets of Beiping was heavy, but thankfully most of the crack troops of the Kwantung Army had fled the city for higher ground in Manchuria. Those who remained either quickly surrendered, or fought to the death. Luckily, zeal alone was not enough to save the Japanese fanatics. 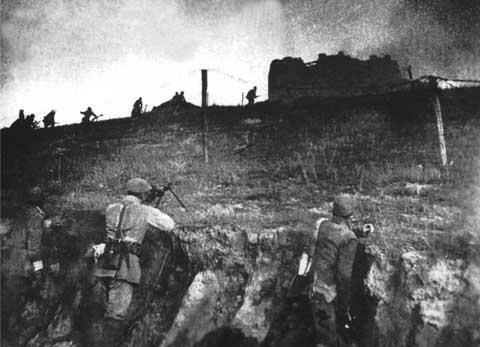 Fortifications, including sections of the Great Wall, were the last to be captured, as the desperate Japanese holdouts fought for their lives. Some hoped for rescue from their comrades, who were now hundreds of kilometers away, fleeing into Manchuria Proper. Others fought out of dedication to the Emperor, or out of a personal sense of honor. Either way, all of them are dead or in chains now. The 52. Juntuan Corps and 1st Mountain Corps triumphantly parade through the city, a day after the last holdouts were captured or killed. They march to jubilant music and throngs of civilians, who are finally free from Japanese oppression and brutality. Many cultural artefacts, including countless valuables from the Forbidden City in Beiping, were looted when the last of the Japanese defenders retreated to Tianjin and back into the sea. These will be returned in due time. The celebration must wait for now. 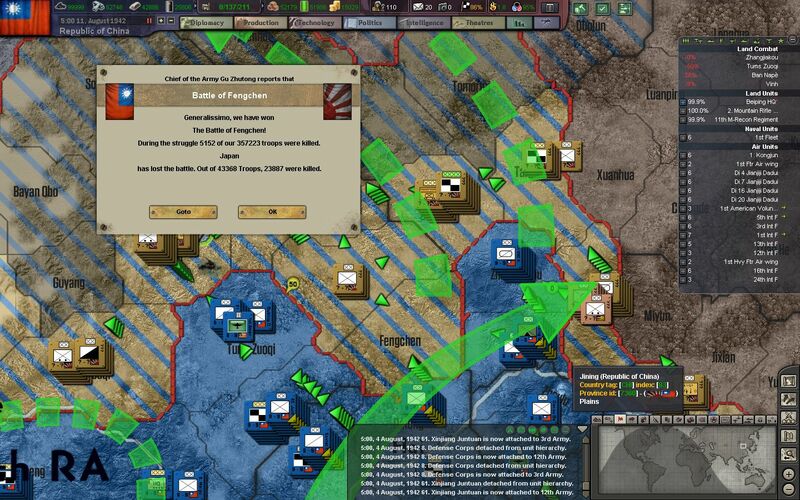 Our troops are given a few days rest before they are ordered to liberate Tianjin. Once again our elite mountain divisions lead the way, while the regulars move house to house, and street to street, to mop up the last of the resistance. 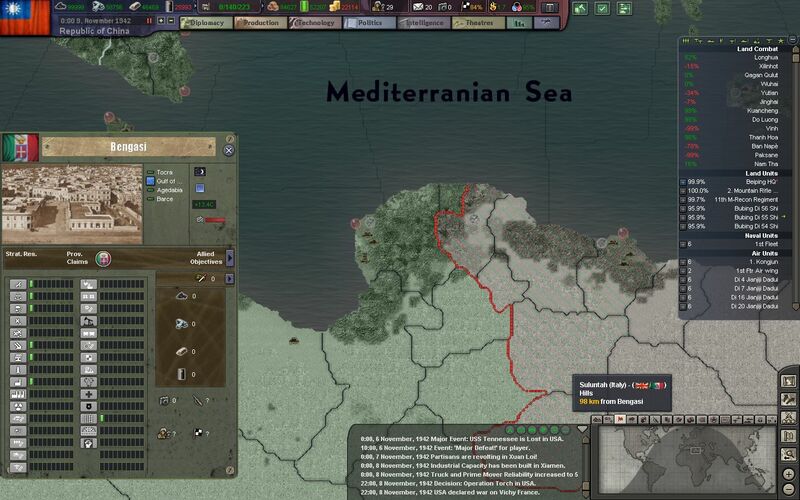 The USA, instead of landing in France or Italy, decides to first help out the British in North Africa, by landing an expeditionary force in French-occupied Morocco and Algeria. 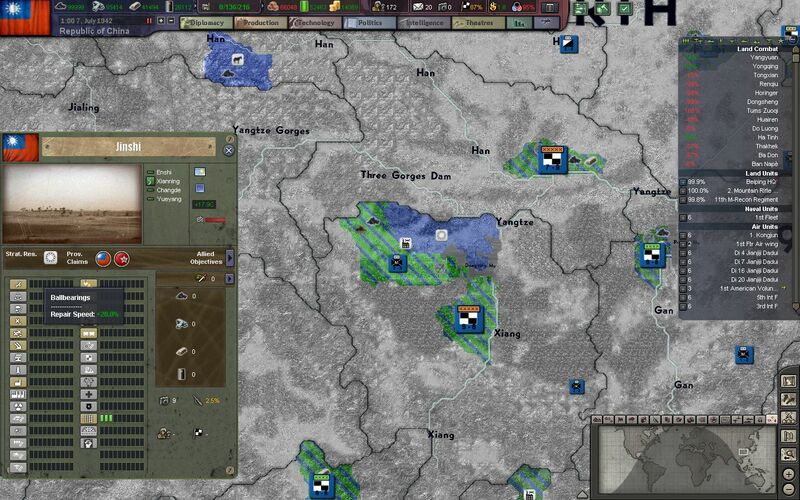 The vicious advance on the Northern Front, as well as the attritious battles in Indochina and Burma, are quickly draining our already meager reserve pool. 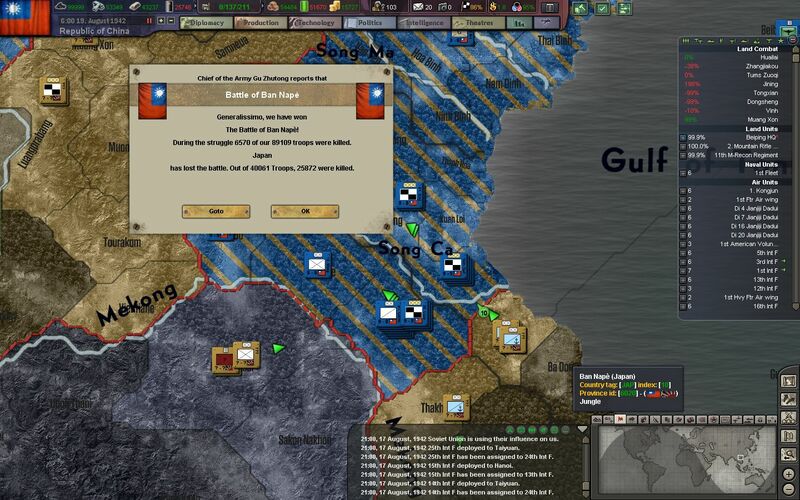 Chiang pressures Marshal Gu to quicken the pace of his offensive in the North. ... and those who do are quickly surrounded and destroyed. 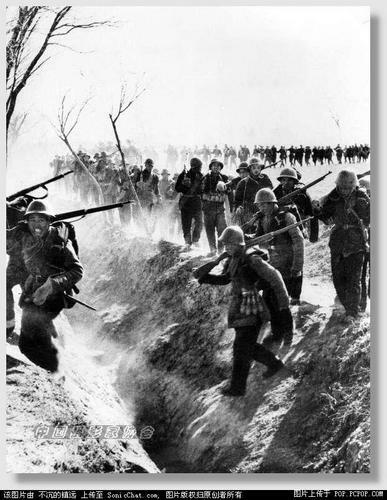 Another 60,000 troops of the IJA are pocketed north of Tianjin, while the rest of the 2nd Army heads along to coast towards Huludao and Dalian. 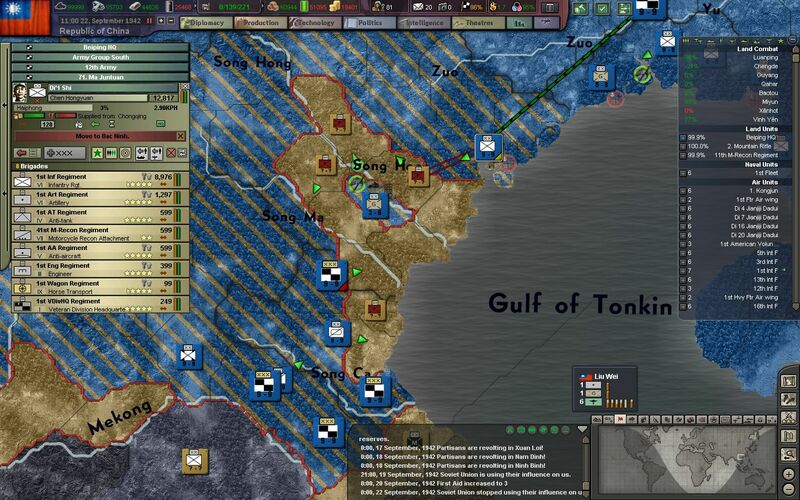 In just a few weeks our troops seize the port of Huludao and now surge down the Liaodong Peninsula, towards the city of Dalian (Port Arthur), which was lost to Japan in the first Sino-Japanese war in 1895. 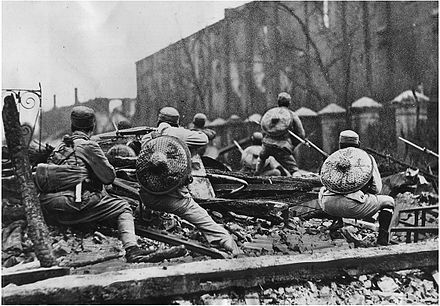 Japanese troops in Manchuria are utterly broken, and few can offer any real resistance. More and more Japanese divisions surrender on sight and are marched into captivity - a much better fate than being cut down by the NRA or the Kempeitai secret police roaming behind the lines. Japanese soldiers that once believed in honor and unquestionable service to the Emperor have been jaded and disillusioned by the alien and inhumane war in China. 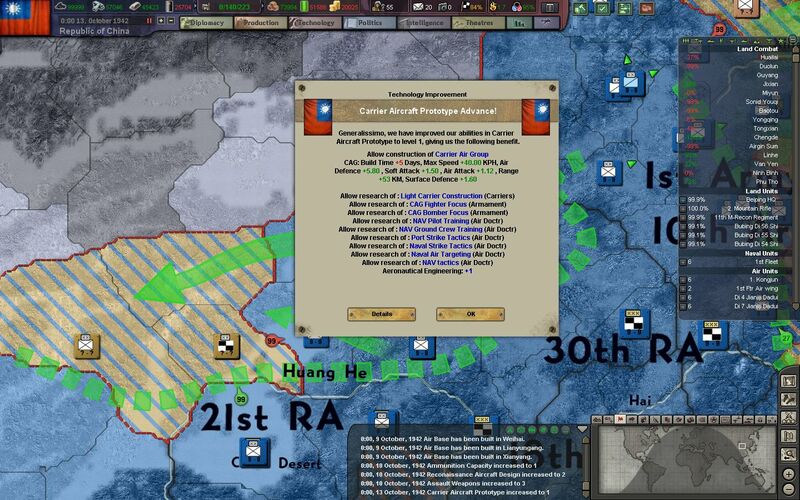 Almost 3 million dead for scraps of land, and the emperor still demands their life? They lay down their arms instead. Our troops begin their assault on the Manchurian city of Mukden (Shenyang), which is only lightly guarded by a few garrison divisions. 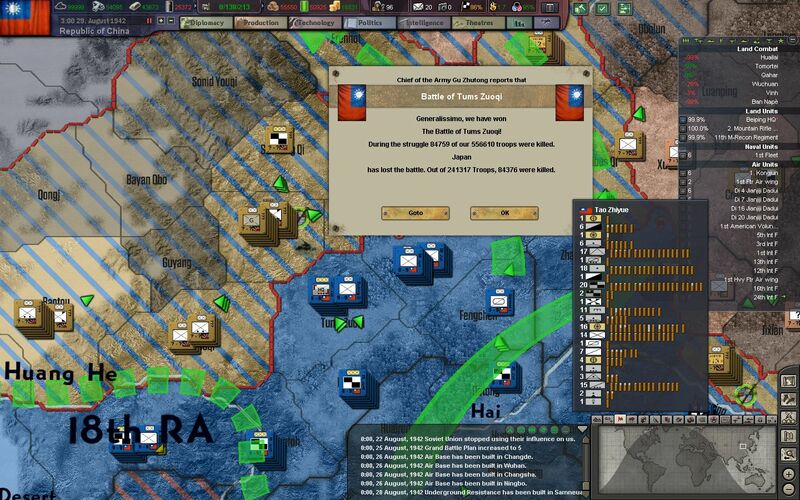 Much of the Kwantung Army has already surrendered, or is in no condition to fight. And in Indochina, our troops struggle with Japanese insurgency, strained supply lines, and an extremely damp monsoon season. After the gambit of Operation Mule, and the deadly battles that followed in Operation Lotus and Operation Blossom, the road to liberation finally lays ahead of us. 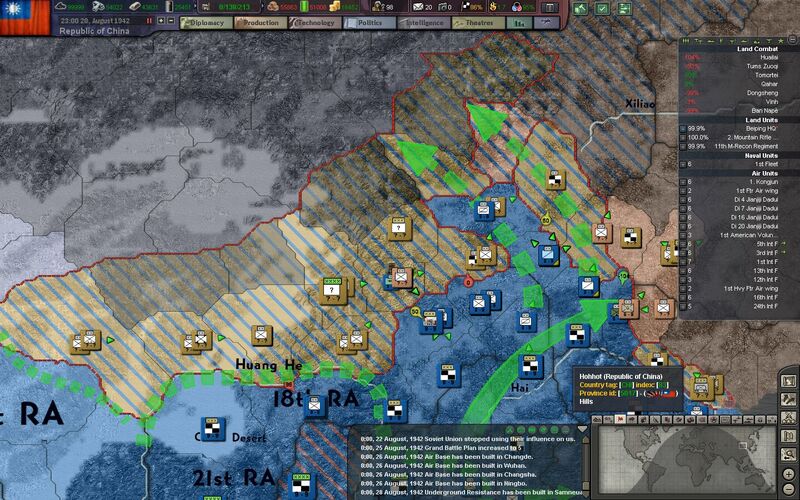 Generalissimo Chiang and Marshal Gu set their sights on the rest of Manchuria and Korea. Thanks for reading! New episodes will be posted on Mondays. As always, feedback on historical accuracy, military technology, gameplay, etc. is welcome in the discussion thread.